It is ideal to use a teflon sheet when pressing your designsas it prevents the upper heat platen clean and to prevent colors from bleedingthrough. 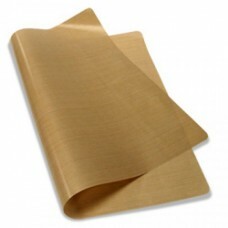 The Teflon sheets are re-usable and last a long time.Prevents ink fromstaining the heat platen and eliminates scorching products, keeps transfers from sticking tothe platen .Can help to prevent ghosting effect often created by transferpapers sliding across the garment while the lifting the platen. Glues, paints, waxes and interfacing will not stick to the sheet. Clean by wiping with wet or dry cloth.